IN A WORLD FIRST, feminists today have successfully guided a remote-controlled probe from a rocket to land on Matt Taylor's bowling shirt. "This groundbreaking work will allow us to answer many of the mysteries of the universe," said Boadicea Hilbertum of the European Feminist Agency. "Where did Matt Taylor's bowling shirt come from? What is its chemical composition? Why does it contain pictures that demean and objectify women who as we all know are able to do anything men do, including landing remote-controlled probes on Matt Taylor's bowling shirt?" This is not the first time such a daring mission has been attempted. Previously, men's rights activists have made several failed attempts to land a remote-controlled probe in Germaine Greer's hair. 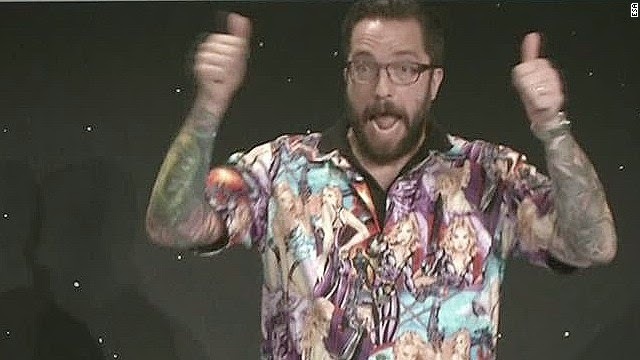 It is planned that the probe will stay for several days, and take samples of the bowling shirt, running them through standard feminist analyses before sending the results back to earth for further verification. In other news, a lot of the world were apparently distracted from this groundbreaking mission by looking at pictures of a big empty rock in outer space. I was expecting a kitchen.